A community altar at the Terlingua Cemetery. The Day of the Dead, or Dia de Los Muertos, is celebrated on November 2nd. The International Chili Cookoff occurs the first weekend in November. These two significant events take place in Terlingua, Texas and, from time to time, coincide. This is one of those years. There are actually two cook-offs now – the Chili Appreciation Society International (CASI) event and the Frank X. Tolbert – Wick Fowler Championship Chili Cookoff, also known as the “Behind the Store” cookoff. 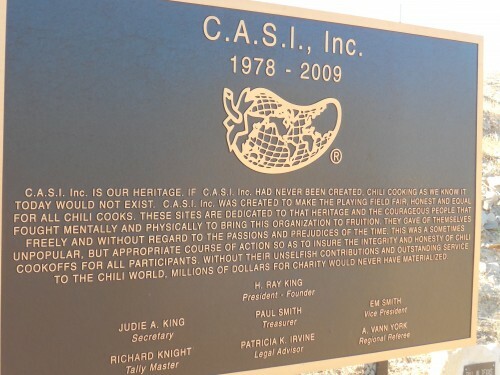 The original impetus for the event was an article in The New York Times entitled, “Nobody Knows More about Chili than I do,” by H. Allen Smith. 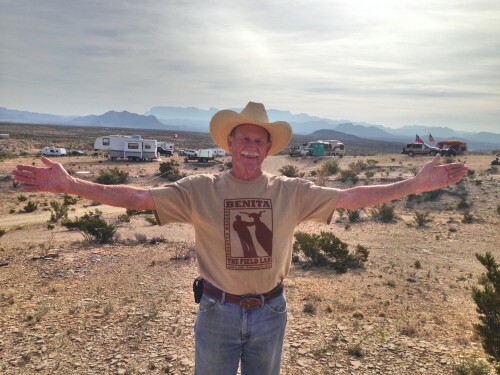 After reading the article, Wick Fowler – a Dallas newspaperman and chili aficionado sent Smith a note that said, “If you knew beans about chili, you’d know chili doesn’t have any beans.” The two men agreed to a show down to be held in an unbiased location and as unlikely as it was, Terlingua, Texas was the place to which they both agreed. That, in a nutshell, is how the competition began. This weekend marks the 47th Annual convention of Chili Heads from all over the world. The actual competition to determine this year’s winners will take place on Saturday for both CASI and Behind the Store and, as of today, there are over 1,500 RVs and Campers at both campgrounds and many of the local motels and inns are full. According to Dwight Hamilton, VP of the Frank X. Tolbert/ Wick Fowler organization, this is just the tip of the iceberg. Thousands of people are expected to fill the area by Friday afternoon. Both events make significant contributions both in the way of tourism and outright donations. Beneficiaries include students at Terlingua High School, the local EMS team, the Brewster County Sheriff’s Department as well as the ALS Association, commonly known as Lou Gehrig’s Disease of which Wick Fowler died. 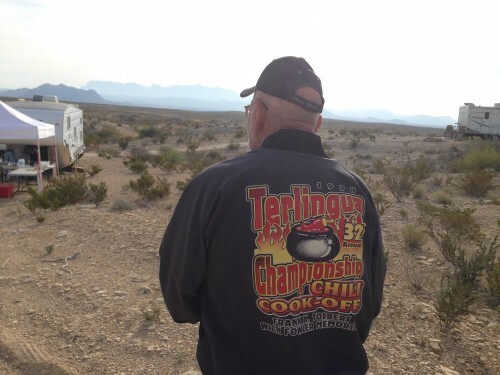 In addition to the Cookoff festivities, a different kind of celebration will be taking place on Saturday at the Terlingua Cemetery. Dia de Los Muertos or Day of the Dead is celebrated by Hispanics the world over and is an official bank holiday in Mexico and in some Central and South American countries. From a cultural perspective, it is one of their most revered holidays. Although the triduum is October 31 (All Hallows’ Eve), November 1 (All Saints’ Day) and November 2 (All Souls’ Day), it is on All Souls’ Day that families gather where their loved ones are buried and, despite the fact that the holiday is universally observed on November 2, the traditions and festivities can vary from one location to another. In Terlingua, families typically begin cleaning up the area around family members’ graves starting on the 31st with a flurry of activity the morning of the 2nd and anyone in the Terlingua community is welcome to help with the cleanup and making way for the festivities. Altars or shrines are erected bearing photographs of the deceased, favorite toys, food items or objects representative of the things they loved in their lifetimes as well as candles, kites, and other symbols of joy and light. 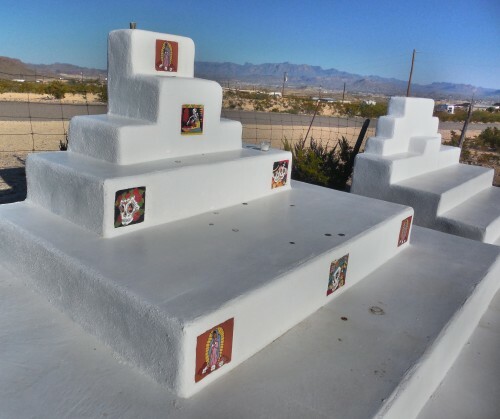 Several years ago, Terlingua restored their cemetery’s community altar where both families with loved ones buried in the cemetery as well as individuals from across the country come to leave mementos, light candles and remember their loved ones. With over 45% of the population of Brewster County being Hispanic, and Terlingua being just across the Rio Grande from Mexico, the Terlingua Cemetery has become home to one of the most beautiful celebrations of its kind in North America. And Mexicans, in particular, believe it is one of the most important festivities. The Mexican people believe they live alongside death –they have learned to accept it as part of their everyday lives and is especially represented in their art and children’s toys. Often there are processions in small towns from the town center to the cemetery with children carrying yellow marigolds and others carrying skulls that have been painted in bright colors with the name of the dead family member. Following the lighting of the candles around sundown, there is a bonfire and potluck, often accompanied by music and dancing. Many who are unfamiliar with the holiday don’t understand that Dia de Los Muertos is a day to celebrate the lives of those they loved and love still. They believe that the spirits of their loved ones join them in this celebration and look forward to the occasion as other cultures look forward to celebrations of their own such as the 5-day celebration of lights known as Diwali in India. The focus on light and love and remembrance is what endears this celebration to so many. Will there be much of a mix of those visiting Terlingua for the Chili Cookoffs and Day of the Dead celebrations? 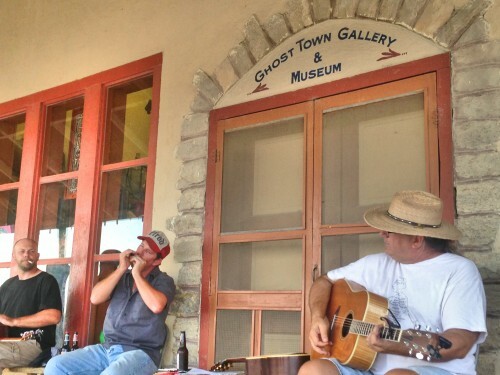 It’s not likely at the campgrounds or cemetery but the good folk who are here in advance of these festivities are mingling in several places throughout town including the courtyard at La Kiva, Long Draw Pizza and, most notably, on the Porch at the Terlingua Trading Company. A woman visiting from Vermont told me last night that while she had heard about the Day of the Dead and was actually here to attend one of the Chili Cookoffs, she was going to be hard pressed to allow anything to take precedence over her “staying parked on the Porch” and listening to the music. Terlingua is known for its rugged, individualistic spirit and residents . . . for being, as Big Bend Ranch State Park’s slogan says “on the other side of nowhere.” Regardless of the impetus for a trek into this Chihuahuan Desert town, and whether the ingredients and contributions lend themselves to the world’s best chili or a most memorable celebration of life and death, the true celebration is the friendships and lifelong memories with which people leave Terlingua. As Jerry Jeff Walker sang in “Gettin’ By” on his Viva Terlingua album (actually recorded in Luckenbach, Texas), “it don’t matter how you do it, just do it like you know it.” What they do around here inexplicably endears folks from far and wide to the people, places, and events in this treasured town and the memories and friendships endure long after the last RV has pulled out of town or the last flicker of light emanates from a loved one’s candle . . .. . . until next year. 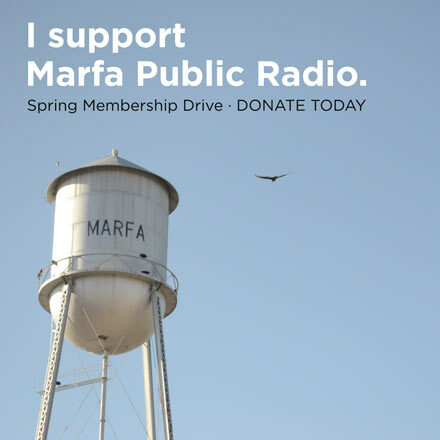 Sharron Reed is a resident of Terlingua, Texas and a correspondent for KRTS, Marfa Public Radio. Jessica Lutz, also a correspondent for KRTS will be providing coverage of these events on November 2. This entry was posted in KRTS News and tagged Chili Cookoff, Day of the Dead, Dia de Los Muertos, Terlingua. Bookmark the permalink.